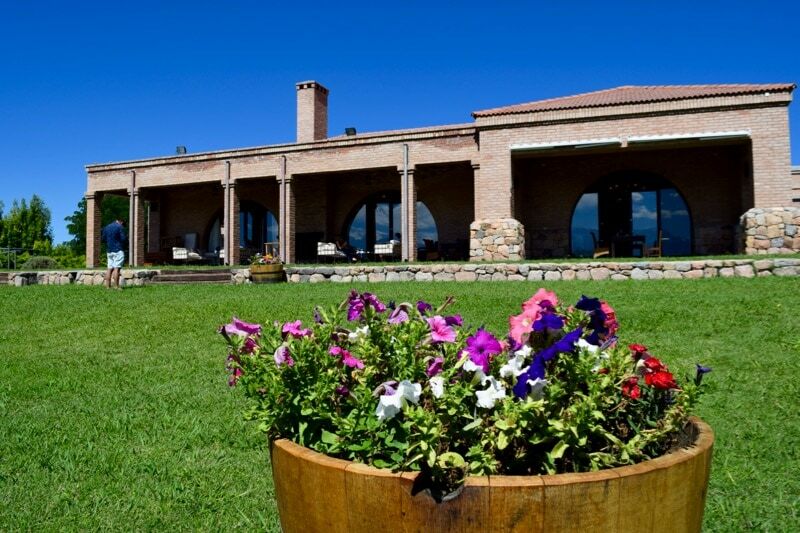 Touring one of Argentina’s top wine regions really is a must-do. It was just after 9am, and all I could think about was wine. 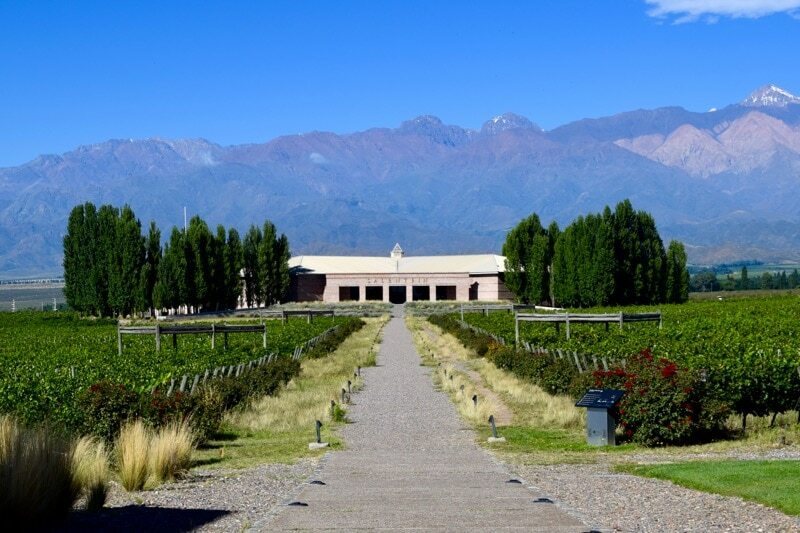 It may sound like I’m bordering on alcoholism but no, I was in Mendoza, Argentina – an area known specifically for its production of Malbec. Today, I’d be learning about wine, exploring a few vineyards and hopefully tasting a whole load too. In the safe hands of Kahuak (one of Mendoza’s top tourism agencies) and with bubbly tour guide Anna Laura leading the way, we headed out of the city to the Uco Valley. 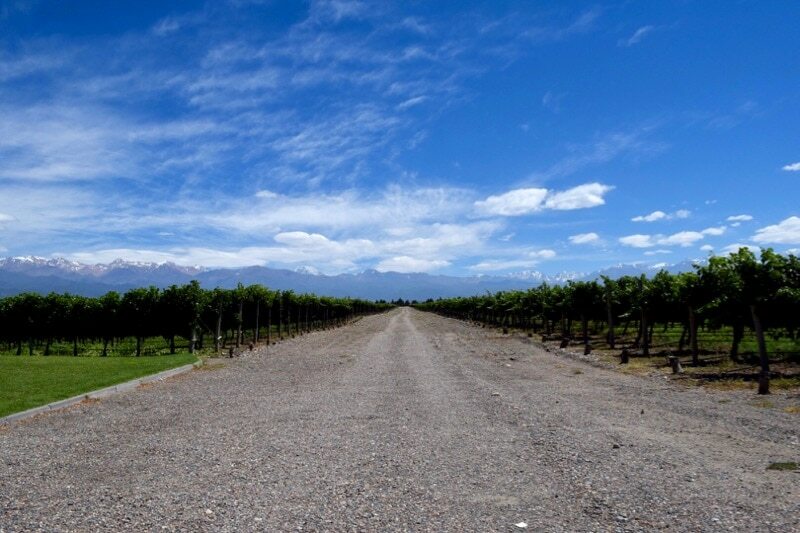 The tour would take us towards the snow-capped Andes to visit three of the Uco Valley’s top wineries – Salentein, Domaine Bousquet and Andeluna. 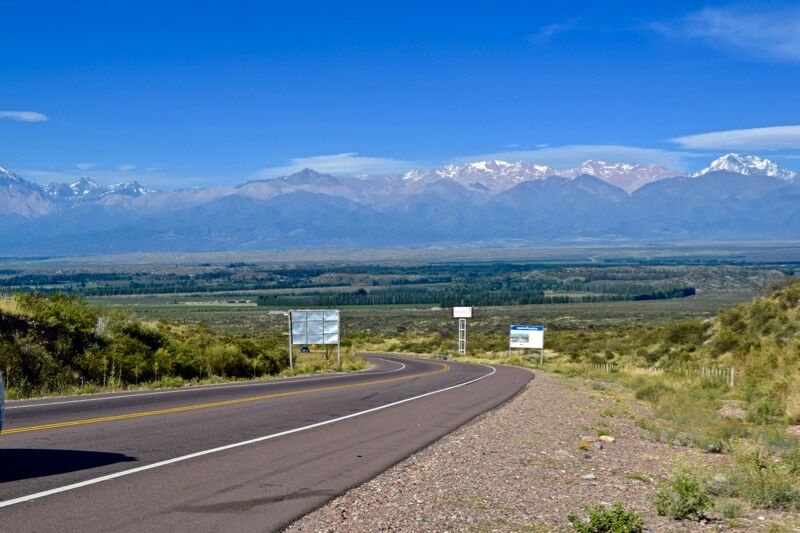 The valley lies around 150km south of Mendoza. It’s a lush region with fields packed with crops (everything from garlic, onions and tomatoes to cherries, nuts and melons) and endless rows of vines. 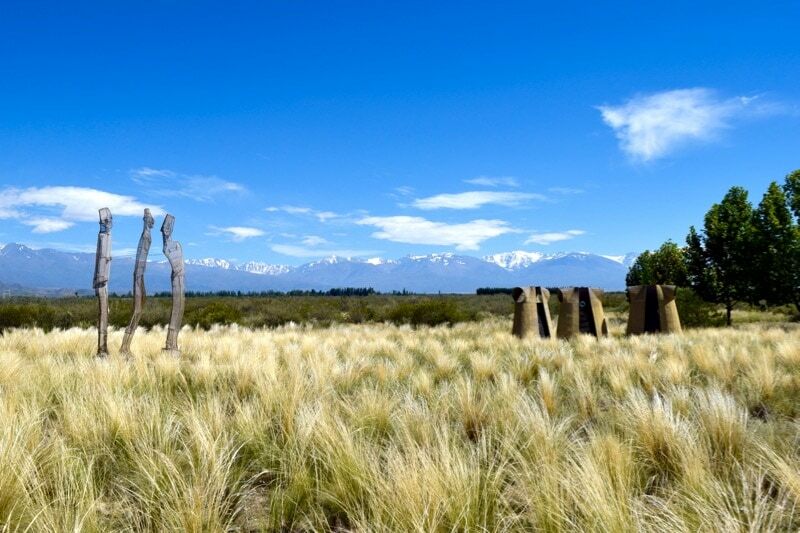 It’s considered Argentina’s ‘new world’ when it comes to wine. 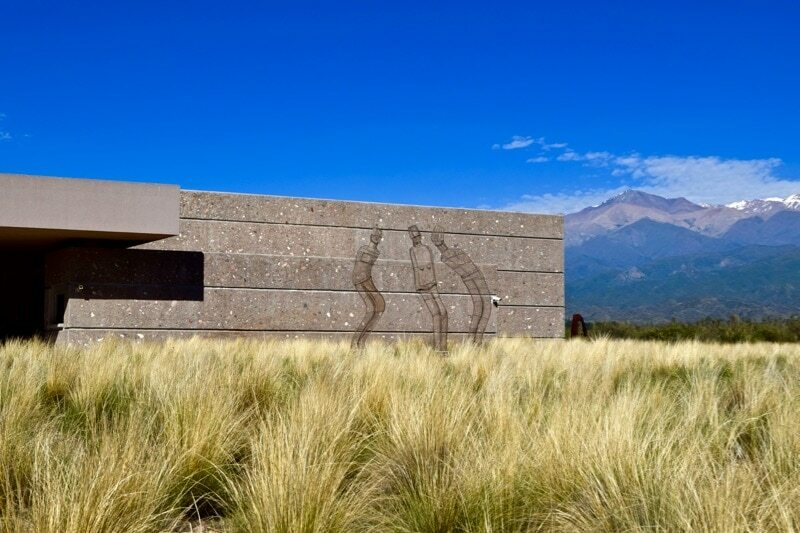 Formerly a region producing average quality table wines, Salentein arrived and changed everything. 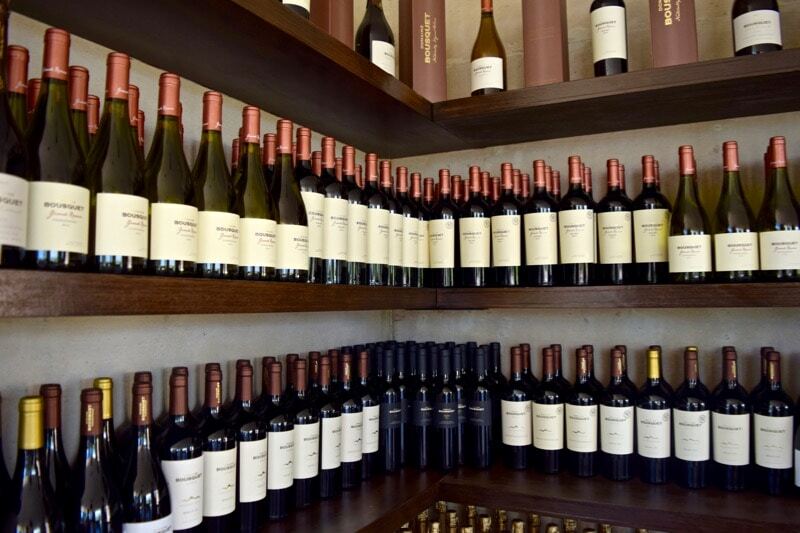 Their icon wines swiftly made a name for themselves, and several others followed suit. 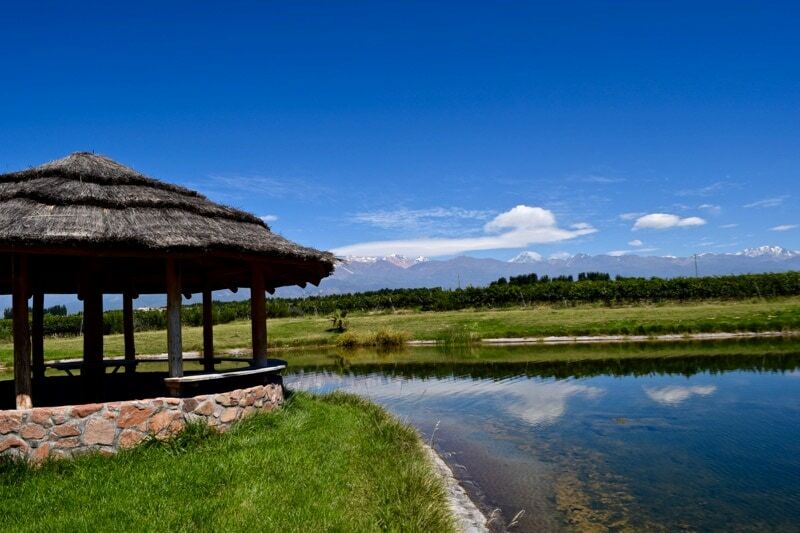 As we passed a checkpoint at Tepungato (meaning viewpoint of the stars in a native language) we spotted plenty of luxury hotels with large gates and long drives. We heard how celebrities frequent these places as they offer ultimate privacy… in fact Ricky Martin happened to be staying at one of them during our visit! 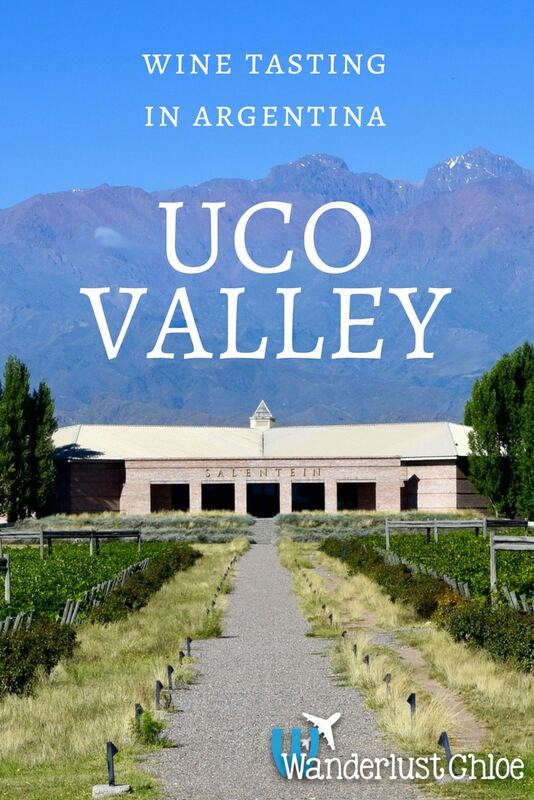 So why does the Uco Valley produce such great wine? 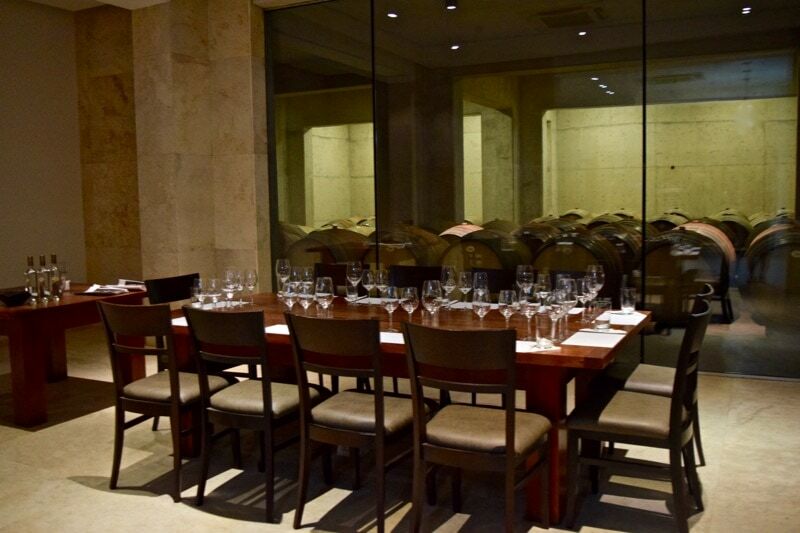 The climate here helps produce grapes with thicker skins, creating more sugar and a greater depth of flavour. 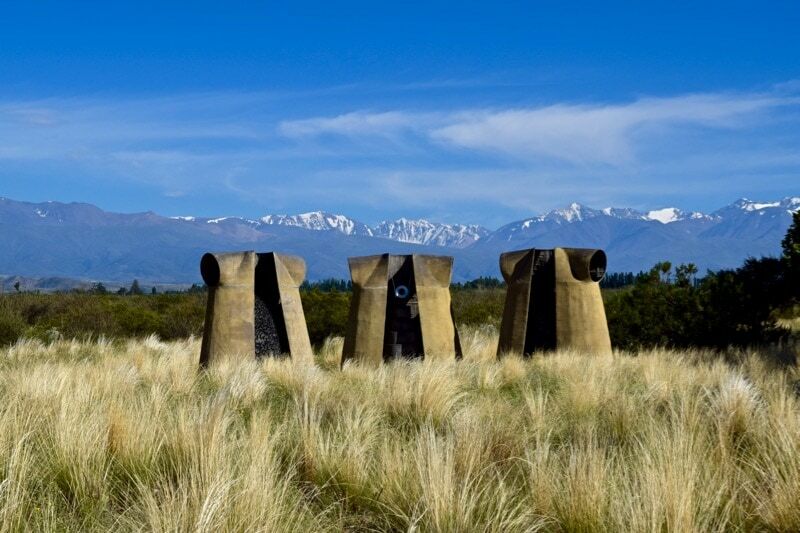 In fact, the skins are 3 times thicker than Argentina’s other wine-producing regions – Maipu and Lujan de Cuyo. 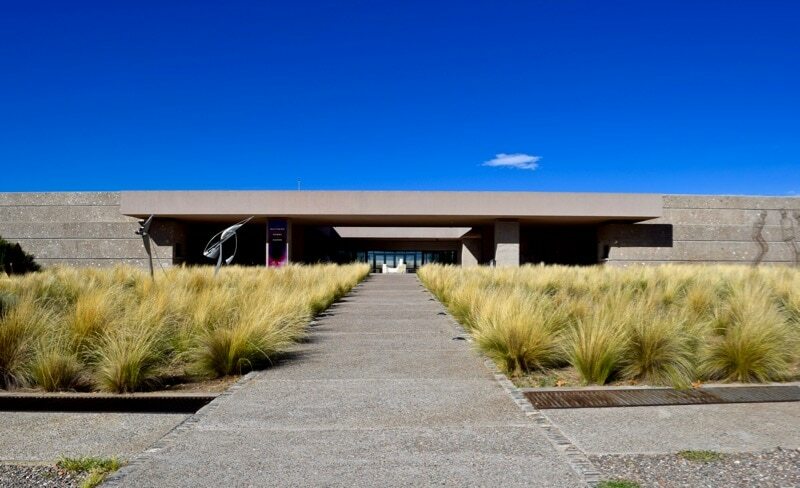 The reception building at Bodegas Salentein is quite a sight. Heavy brutalist architecture in an area of outstanding natural beauty, with a bizarre collection of abstract sculptures standing tall in front. When I ventured inside and looked out to the next building (the winery) things really stepped up a notch. 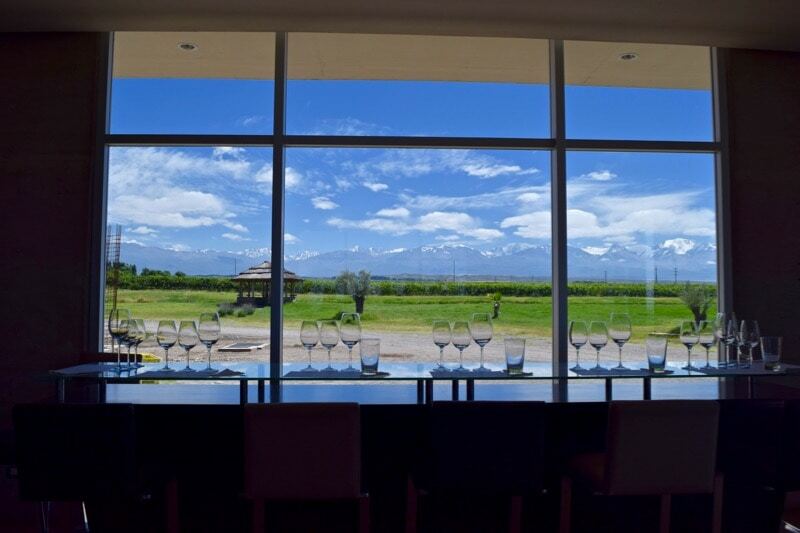 Red roses topped many of the vines, the beautifully snowy Andes jutted out behind, the sky a bright shade of blue, and then the winery in front – a spectacular symmetrical slither. It really was breath-taking. 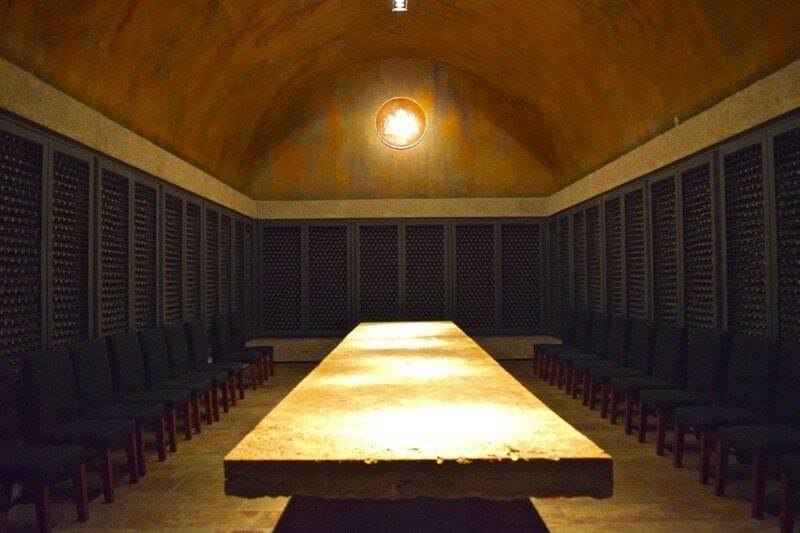 The winery housed the fermentation area, wine production areas, bottling room and an incredible cellar. We learned about their 3 icon wines and how around 50% of their wine is exported to 40+ countries. Well, with 5000 barrels in the cellar, it would be greedy if the Argentines kept it all to themselves! 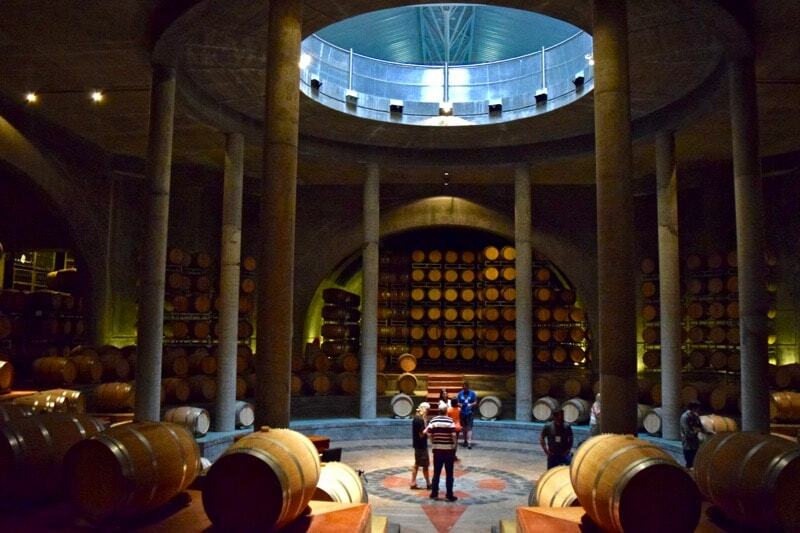 After visiting Lapostolle and Vina Montes in Chile, I felt I’d seen some of the most spectacular cellars in the world… but this was something else. 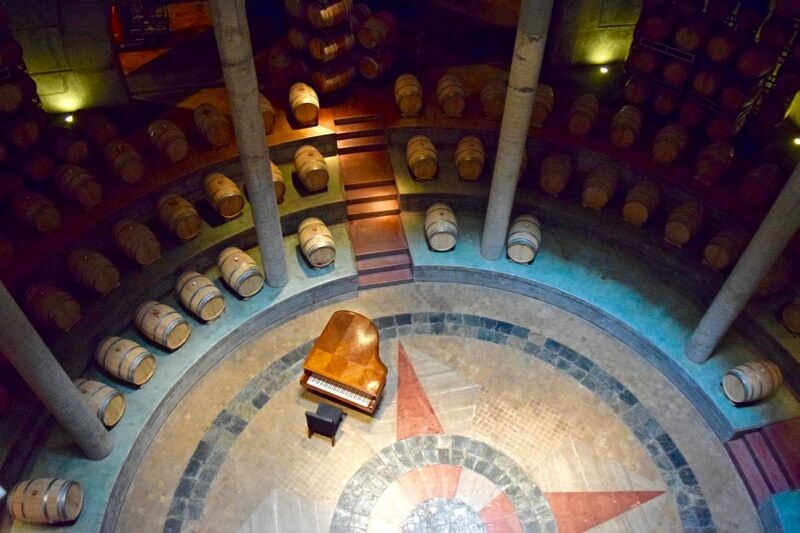 The barrels lay on steps leading down to a huge circular area, like an old roman amphitheatre, with large columns leading up to the viewing area above. A grand piano sat in the middle, and I couldn’t resist but play a few tunes. 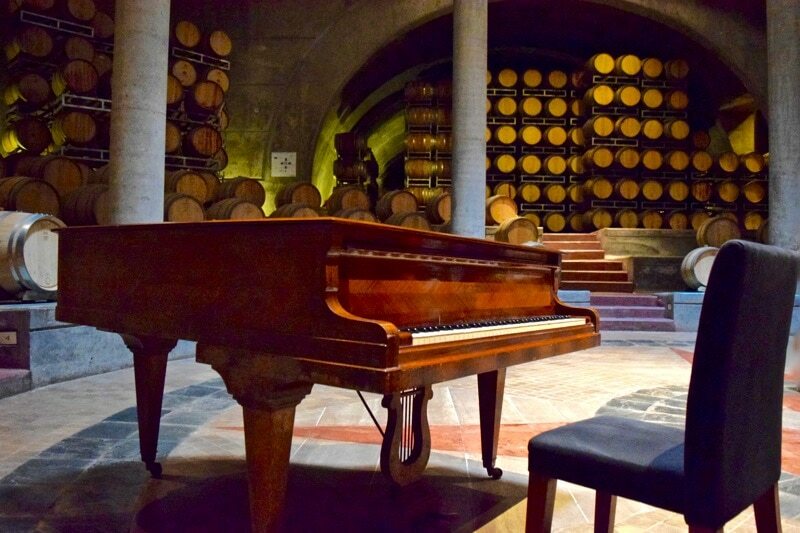 I loved that this was a winery with a real arty side – from the sculptures and paintings, to the regular music recitals they hold in the cellar – creativity oozed out of it. 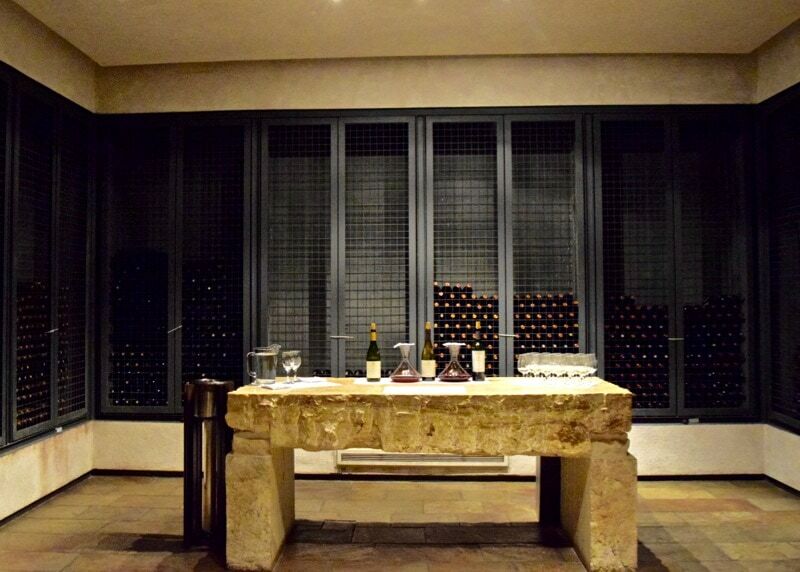 We learned plenty about wine… but eyes on the prize, it was time to enter one of the spectacular wine tasting rooms. We sampled several wines starting with a deliciously light chardonnay (yes that’s not an oxymoron!) with notes of tropical fruits and only a light oak flavour. The pinot noir had been aged for 10 months and tasted almost like a rose wine, with flavours of strawberries, raspberries and vanilla, then an aftertaste that tasted more of a red. The 14-month aged malbec packed a punch! With its deep purple colour, flavours of red fruits and a long, totally delicious, aftertaste! After half an hour in the dark cellars, we emerged back into the scorching temperatures and bright daylight. No time to sober up, the next winery was moments away. 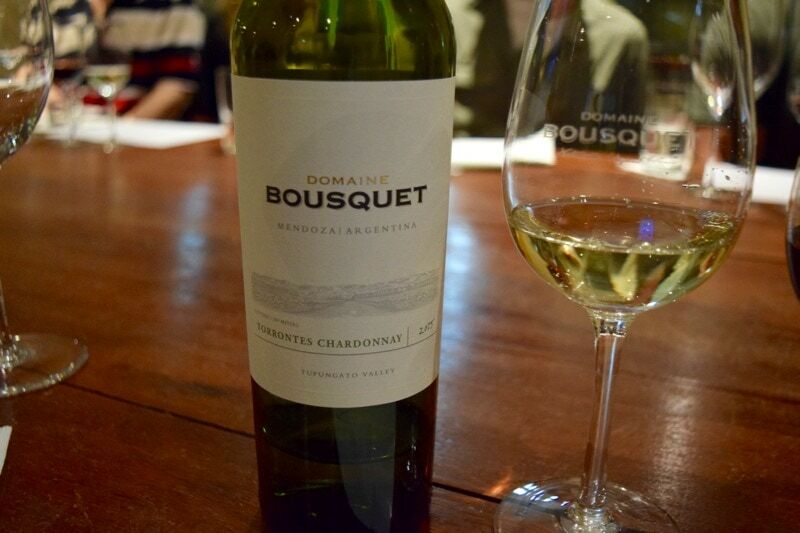 Unlike most wineries in the region, Domaine Bousquet is fully organic – in fact it’s the largest in Argentina. It was great to hear the story behind the place. 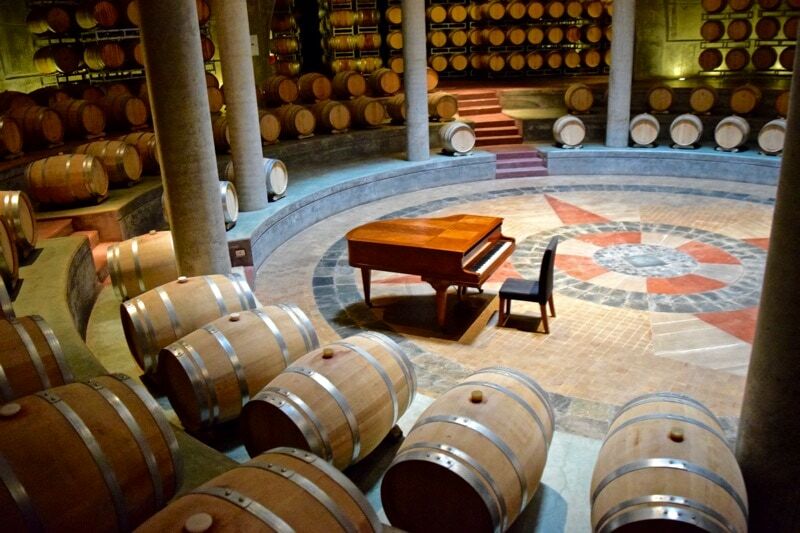 The French owner had been desperate to set up the organic winery in the south of France but couldn’t find a location with the perfect climate. 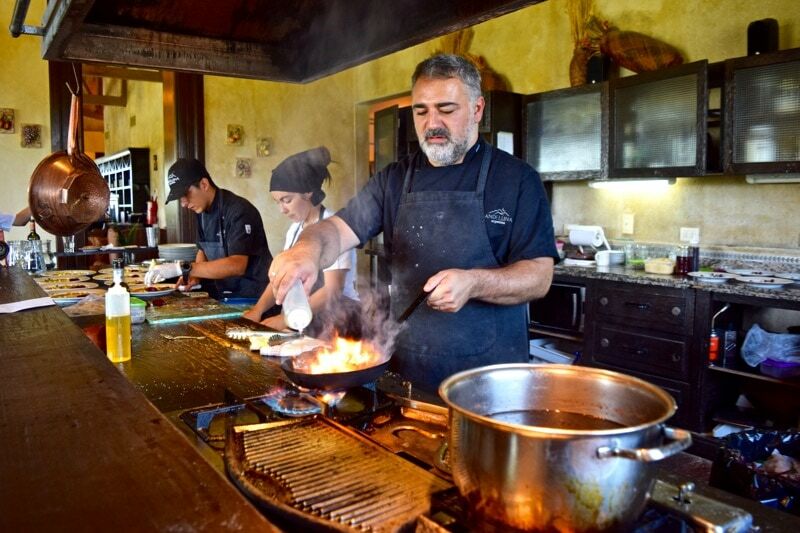 He travelled the world and in 1998 fell in love with the Uco Valley. He bought several hundred hectares and set to work. 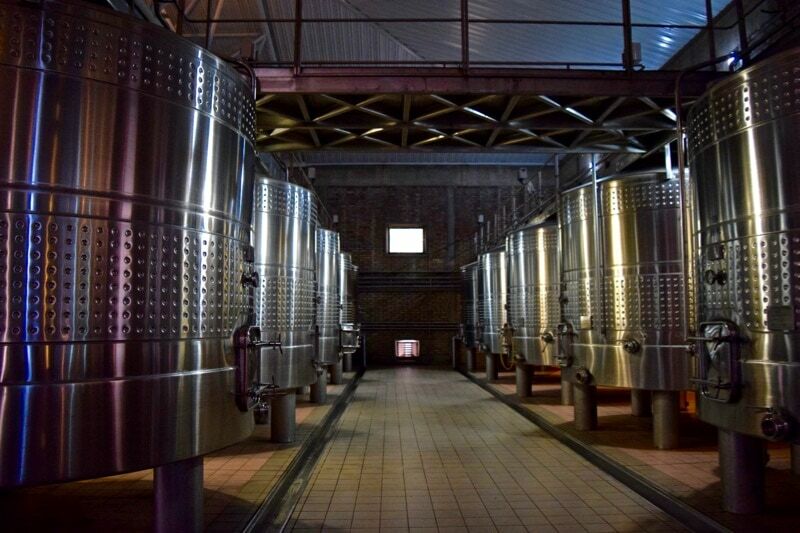 Producing 3 million litres a year, Domaine Bousquet exports 90%, mainly to Scandinavia and other European countries. 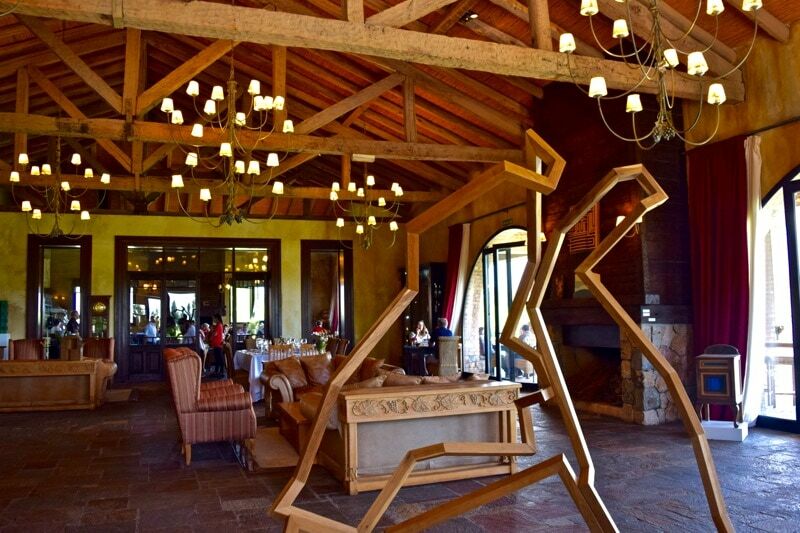 It was a lovely location, with their own natural reservoir, and a spectacular bar looking out to the vines. They have 4 different lines; Premium, Reserve, Grande Reserve, and Icon. It was interesting entering one of the working production rooms. Unsurprisingly really, it reeked of wine, and was very industrial. Watching men moving crates of grapes around on small trucks felt worlds away from opening a lovely bottle of red at home with dinner. 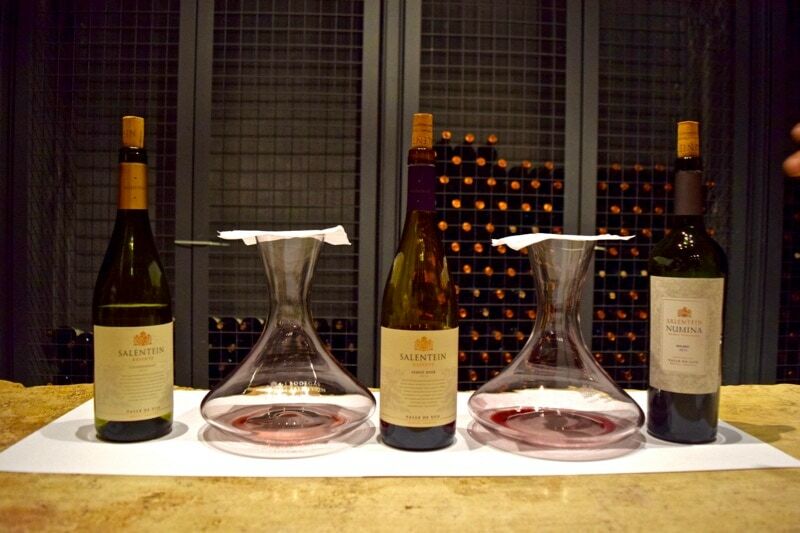 We sampled a light, crisp summery 2015 Chardonnay, followed by a Reserve Pinot Noir from 2013, followed by the big one – the Malbec Gran Reserve 2012. At 15% it’s the strongest one in their range. They were so different from the wines at Salentein, despite being produced metres away from each another. Again, with no time to sober up, we rolled back into the bus to Andeluna where we’d finally eat something. 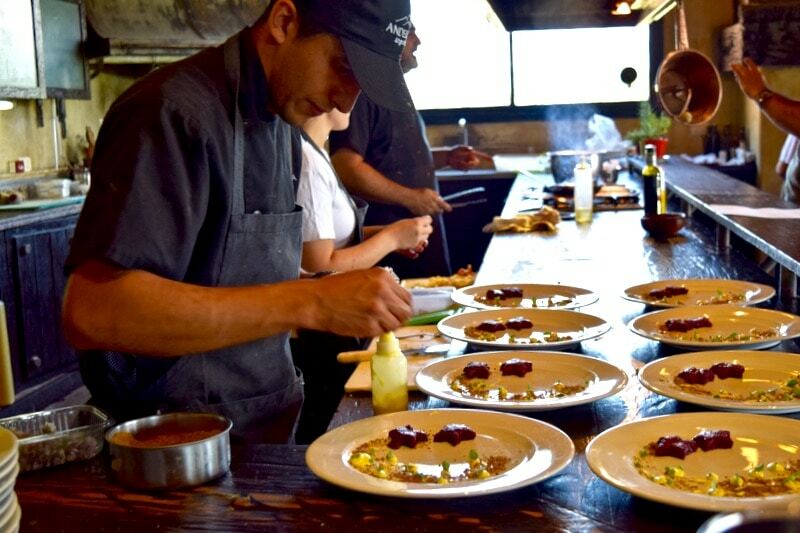 When tipsy, I usually crave carbs, but this wasn’t the end of the night, it was early afternoon and we were about to tuck into a 6 course-tasting menu… with wine pairings! Usually I take plenty of notes during restaurant reviews so I know I’ll be able describe everything to you in great detail. My notes for this meal seem to be just a few lines long. No this wasn’t because I didn’t enjoy it – quite the opposite. I enjoyed it so much I forgot about the notes. Luckily, I took plenty of photos and a menu, so all is not lost! 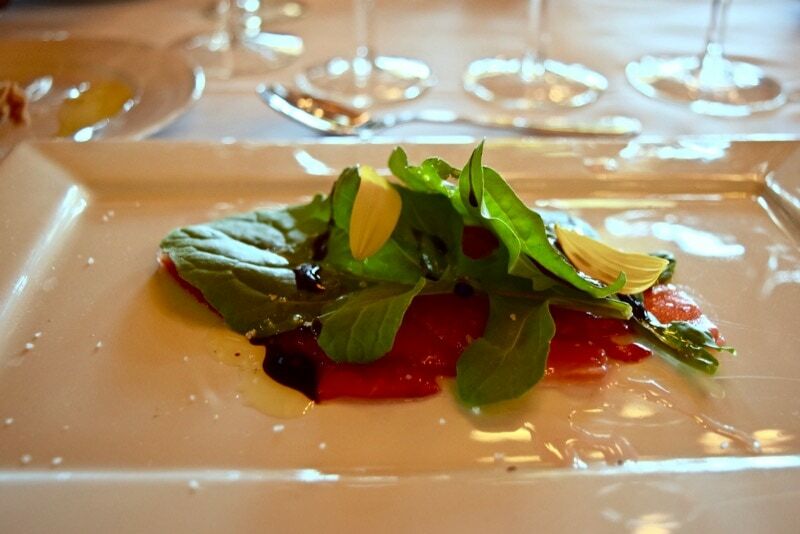 We started with a roasted watermelon carpaccio topped with rocket and a balsamic reduction. It was a really surprising dish – it looked like beef carpaccio, and was salty and meaty in flavour, despite being fruit! 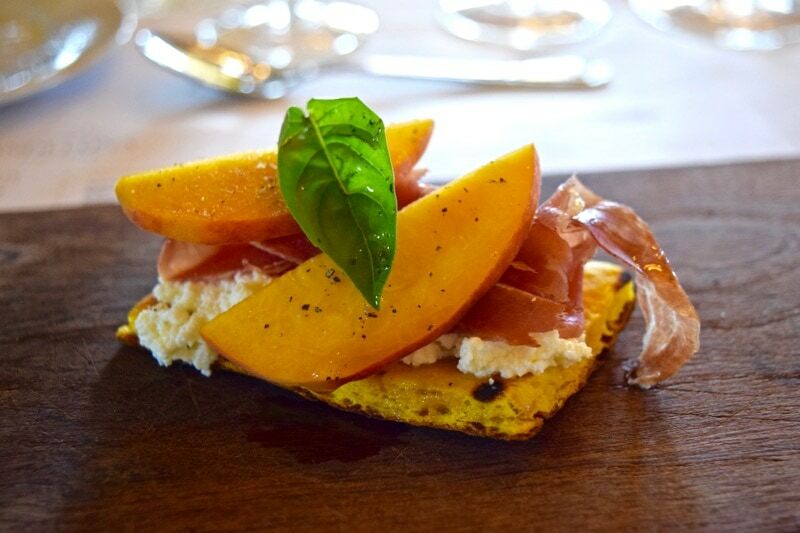 Next up a squash pastry topped with ricotta and cured ham, and peaches – again a wonderful mix or sweet and savoury, washed down with an oaky glass of Altitud – a chardonnay from Andeluna’s Reserva line. 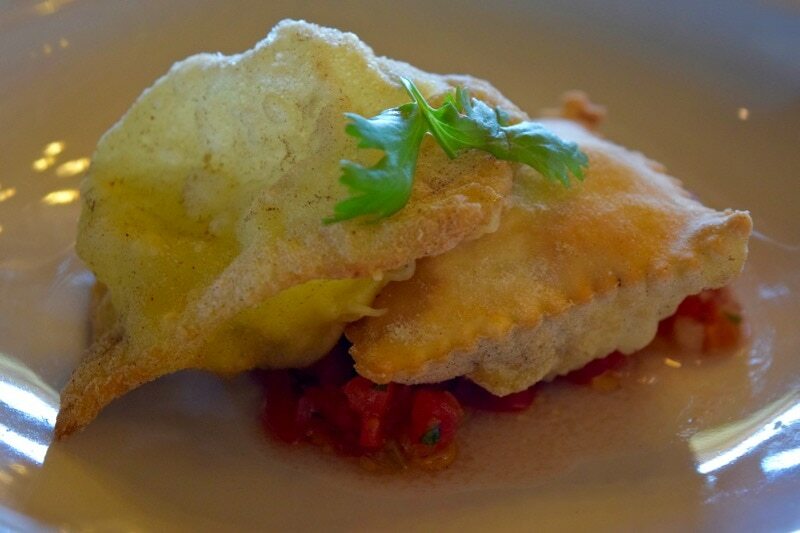 The next course was a large fried ravioli stuffed with cheese and served with a salsa containing tomatoe, onion, coriander and pepper. This came with a powerful glass of Andeluna’s 2014 Malbec. 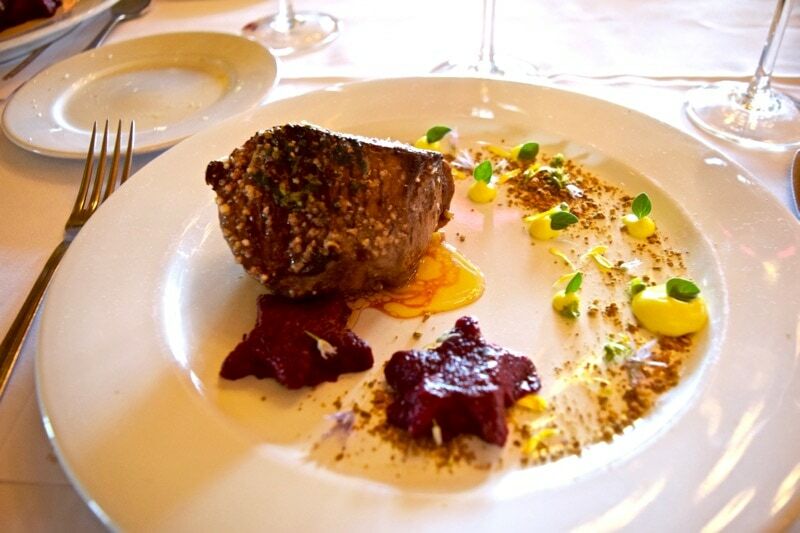 When the huge slab of filet mignon arrived, I was already feeling a little full, but it looked delicious. 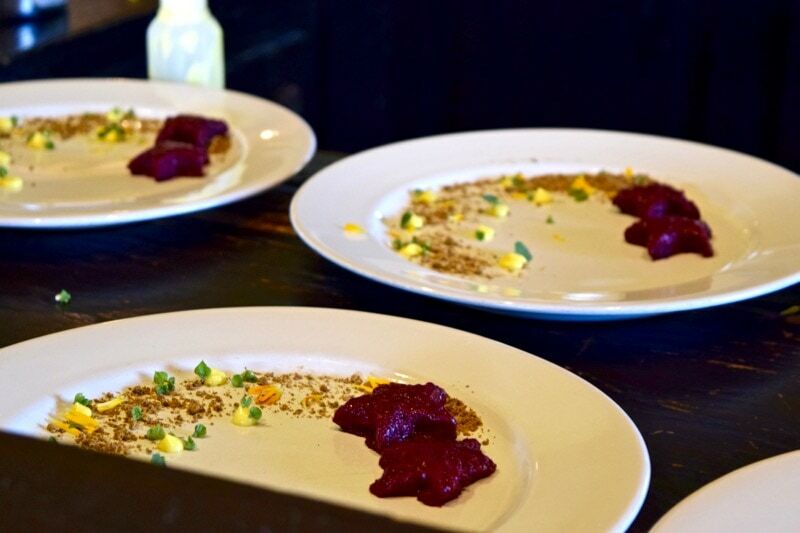 It came with a lemon and oregano butter, a saffron mayo and cute beetroot stars, with crunchy toasted pistachio adding a bit of texture. I went to watch the chefs at work as they fried steaks for the whole table perfectly to order. Flames licked the ceiling as the chefs seasoned the steaks with large pinches of salt and pepper. As ever, a little on the salty side for me, but the full bodied Andeluna Pasionado matched the dish beautifully. I enjoyed a coffee outside on the terrace gazing out at the bright blue sky and lush green vineyards, and quietly reflected on a great day. It had been tiring – eating and drinking often is… but I’d just about survived. I knew I wouldn’t need another meal, or another glass of wine that day, but that probably wouldn’t stop me! 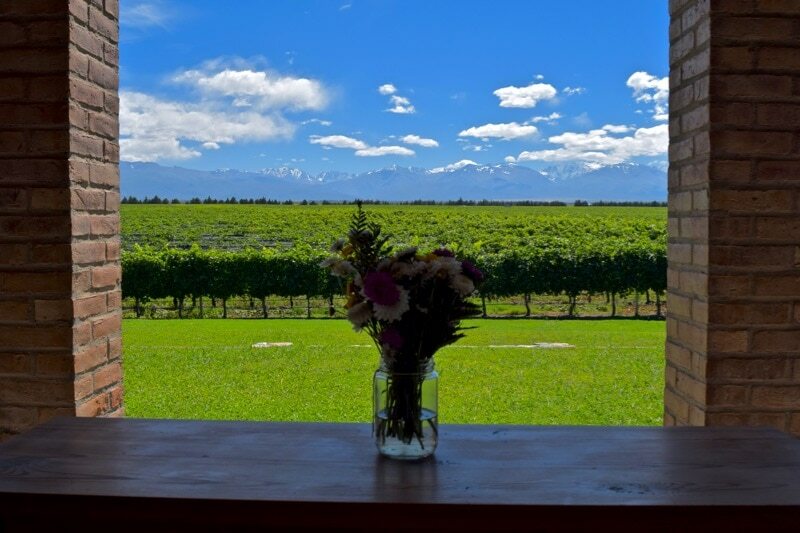 If you’re staying in Mendoza, you can book tours to the vineyards in nearby Lujan de Cuyo, but I’d certainly recommend heading out to the Uco Valley as it’s as much about the scenery and architecture as the wine. Thanks to Kahuak for inviting me along to experience their Uco Valley Wine Tour. The tour costs AR$ 2300 (approx. 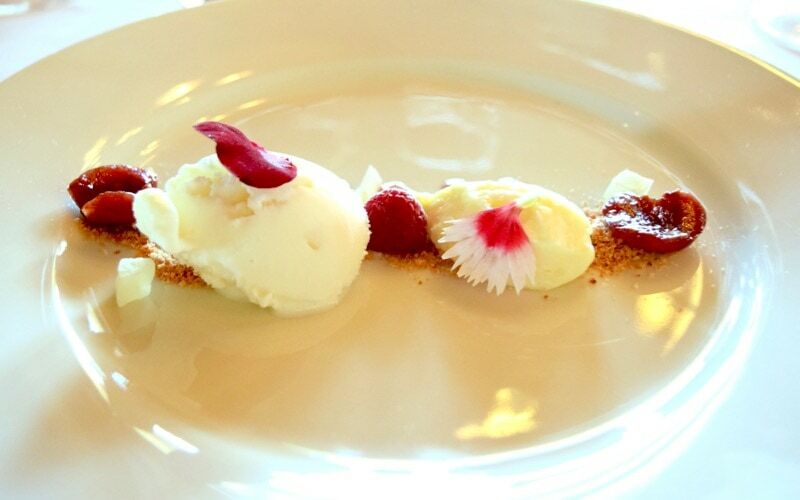 £112) which includes tours and tastings at 2 wineries, plus a 6 course lunch with tastings. Find out more about the tours they offer here.